95 Dollar Letterpress cards!? You must be crazy! Yes, yes we are. We are able to offer such a great deal by limiting options, using easy templates or supplied designs and taking orders online. That way we can trim setup charges by ganging up runs and keep the price at a fraction of custom work pricing. The printing can be complex and we have to balance the needs of all cards in the set. If your cards have special needs you should consider running your card as a custom job so they can get that level of personal attention and customization. What are your design specs? What file formats do you accept? CARD SIZE is standard 2"x3.5" (50mm x 90mm). If your card artwork bleeds (goes off the edge) please include at least a 1/16th inch bleed. Any type set in Photoshop will NOT print clean. Again, please send your fonts with your design! Please include any linked images. How should I design for letterpress so my cards turn out awesome? 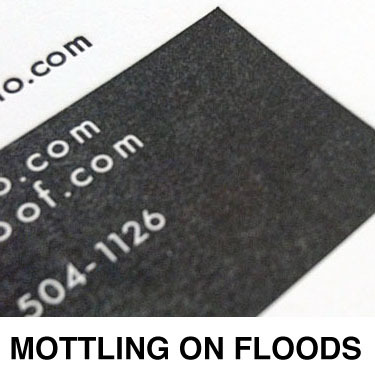 Large solid floods will appear mottled. (Kind of a salt and pepper look where the ink coverage isn't totally solid) We do limit floods on these to be less the 40% of total area. Anything more then that is too needy on press and needs to be printed as a custom job. Fine cutout type in a solid flood area (reverse type) can plug up and won't produce well. Line art and illustrations print really well, just don't get the lines smaller then .3 pt. Type shouldn't be smaller then 6 pt or thinner then .3pt, it's best to outline the fonts or include your fonts with the file. You can only print solids in letterpress, no gradients, you can do half-tones but they need to be a little chunky. Where can I get a template? You can download a layout template by clicking here. Its a PDF template you can import into your design program. Can I substitute the black ink for another color or a blind (ink-less impression) or can I upgrade and add on more colors or a blind? The $95 dollar cards have limited specs. By limiting options we can offer this great deal. 3 Paper choice, one as an upgrade. Limited edging colors avalible as an upgrade. We can absolutely print other option besides these, but they will require custom pricing so you should tell us what you need on our estimate form. Can I rush the production? Yes. When we have the capacity in shop you can select the rush option in checkout. If you don't see the option that means we don't have room in our schedule and will add the option back in when we do. Can I use a different edging color? The $95 dollar cards are avalible in 10 colors: Yellow, Orange, Red, Blue, Green, Aqua, Gold, Black, Neon Pink, Neon Orange. Custom edging colors require custom pricing. Also note: We don't allow edging on designs that bleed off the edge of the card. The impression running off the edges from printing can interfere with the edging process. Will I get a proof of my card before printing? Part of the cost saving nature of these cards is that we are either using preset designs or your own design. So a proof isn't necessary which helps us keep the cost down. You just need to double check all your info when you check out and make sure it's typed in the way you want. Requests for screenshots of your layout are avalible by request when the work load allows.